With Live Loops, you can trigger song elements with a tap. As well as releasing its Music Memos app, Apple has also unveiled an update for the iOS version of GarageBand. Version 2.1 adds Live Loops and incorporates the Drummer feature from the company's desktop DAWs. Live Loops are said to be inspired by DJ hardware controllers and drum machines. These can be triggered by tapping cells and columns, with everything being kept in pitch and time as you go. A library of loops comes included (this covers EDM, hip-hop, dubstep and rock) and you can also create your own. In other words, Apple is offering an alternative to the traditional timeline-based arranging method. It'll be interesting to see if this makes its way into either the desktop version of GarageBand or Logic Pro X in future updates to those apps. 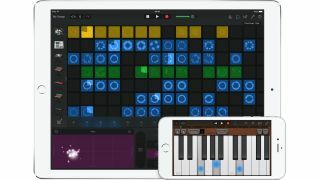 But we're getting ahead of ourselves: GarageBand for iOS 2.1 also adds nine virtual session drummers who cover a range of EDM and acoustic bases. There are more bass amps, too, plus new automation features and a "simple EQ". If you have an iPhone 6s or iPhone 6s Plus, meanwhile, you can play keyboard sounds with polyphonic aftertouch via 3D Touch. You can find out more on the Apple website, and GarageBand for iOS 2.1 can be purchased for £3.99/$4.99 on the Apple App Store.